Data from NASA’s Lunar Reconnaissance Orbiter has revealed the presence of tunnels at the moon’s north pole that were once filled with lava but now store potentially vast quantities of frozen water. 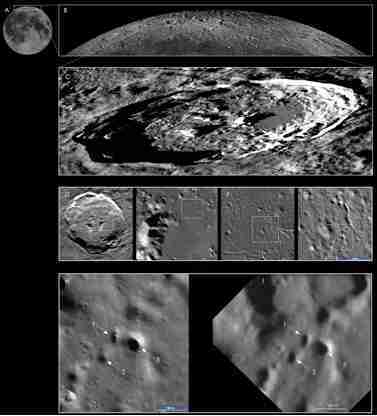 The north pole of the moon appears to be riddled with dozens of pits leading to underground lava tubes, according to new research released Jan. 11. If these belowground caves host vast amounts of ice — which scientists believe is possible — astronauts could harvest the ice and use them for future moon missions. Data from NASA's Lunar Reconnaissance Orbiter pinpointed the pits on the northeastern floor of the, which is at about 72 degrees north latitude. Each pit is about 50 to 100 feet across (15 to 30 meters) and located along a lunar sinuous rille, or lava tube, which were once underground tunnels filled with lava. Discovering potential lava tubes at the moon’s north pole represents a boon for future space explorers. While the moon hosts hundreds of known lava tubes, most of them are in regions with little ice. The northern ones, by contrast, appear in an area with known ice. In fact, that's why lead researcher Pascal Lee, a planetary scientist at the Search For Extraterrestrial Intelligence Institute, looked at the north pole in the first place — to find an easier way to access the ice. The ice at the surface appears to be mixed in with regolith, aka moon dirt, which would make it hard to extract. "You would have to bulldoze tons and tons of earth," Lee told Seeker. "You can't even count on solar power, due to the weird lighting conditions, and the temperatures are very cold. It's physically possible, but presumably not economically viable." Finding the pits was no easy task. The moon's north pole has harsh lighting that makes it difficult to distinguish ordinary craters from a pit leading to an underground entrance. Lee joked that most of his searching from LRO data resulted in "pictures of high-resolution shadow." But the sun shone at just the right angle in some of the pictures, revealing the pits. Now that Lee's search hit pay dirt, he says the next step is figuring out how much ice is within the reservoirs. More pictures from above won't really help, Lee said, because the lighting is difficult. Instead, he advocates sending a rover to the surface equipped with ground-penetrating radar. The rover could squat nearby a pit opening and use radar to image the surface below. This would show the presence — or absence — of ice. A drone would ideally be used during a follow-up mission. Lee regularly tests drones as part of the Haughton-Mars Project, a research effort that takes place every summer on Devon Island in Canada. The researchers normally focus on technologies for human missions to Mars, but drones would work on both the moon and Mars, Lee said. A typical drone today is almost smart enough to navigate obstacles on its own, using artificial intelligence, he said. With a few more years of development, drones could be deployed on the moon. The drones could fly into the lava tubes, collect images and data and then fly out again to transmit the information back to a nearby lander — or back to Earth directly. From there, Lee said there could be enough data to justify sending humans into the lava tubes to extract water and conduct experiments. Some science fiction scenarios envision humans using these tubes as shelters, but Lee said an artificial dome protected by sandbags would be a much better seal against the moon's airless environment. There is no robot mission scheduled after the Lunar Reconnaissance Orbiter, which is in good health. But it has been orbiting the moon since 2009. NASA is recasting its lunar exploration plans after the Trump administration announced last year that they plan to send astronauts back to the moon. Luckily, NASA does have an idea to send a polar-orbiting space station to the moon called Deep Space Gateway. The space station would orbit pole-to-pole — allowing the astronauts to look at the potential lava tubes from their perch in orbit. Lee presented his research at the Lunar Science for Landed Missions Workshop, which was convened by the Solar System Exploration Research Virtual Institute at the NASA Ames Research Center in Silicon Valley, California. Philolaus Traverse from SETI on Vimeo.